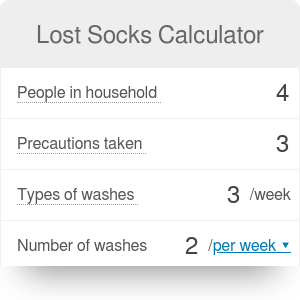 Socks Loss Index estimates the chances of losing socks in a laundry. How many times have you collected your laundry just to realize one of the socks is missing? Probably quite a few. Don't worry though, this problem has been affecting millions if not billions of people ever since socks were invented back in 8th century BC by Ancient Greeks. While we still don't have a perfect solution for the problem, thousands of tips have been gathered throughout years. And recently a group of scientists finally came up with a formula for probability of losing socks. Psychologist Simon Moore of behavior change consultancy, Innovationbubble and statistician Geoff Ellis at Evolution met together to analyze thousands of cases of lost socks and come up with a realistic formula. They took into consideration various factors, such as frequency and type of laundry, number of socks, number of precautions taken and even your attitude towards the process. And they came up with so-called 'Socks Loss Index". For the purpose of calculating amount spent on new socks we assumed that for each sock lost you buy a new pair. If you have multiple socks in the same colors or simply don't mind wearing different socks - this number will be lower for you. To return lifetime money lost amount we used the current global life expectancy which is around 71 years old. This number might vary depending on your country of origin, gender, health and a lot of other factors. Socks Loss Index can be embedded on your website to enrich the content you wrote and make it easier for your visitors to understand your message.